Would you like to have a dance party with the lights changing to the music? You would be surprised at the things these smart lights can do for such a low price. There are many smart lights out there so we picked the 5 best smart lights without hubs. Many smart lights require hubs. Hubs are just small devices that can link up the lights and make them controllable. This article is going to exclude all of those with hubs because it’s less expensive getting started without a hub. Even though these lights don’t require a hub, they still have many of the same features as those with hubs. There are some advantages to having a hub however. Connecting large amounts of wifi lights all over the house would be better off having a hub to control them. Hubs also allow you to connect lights to other smart home technology. Lights without hubs are good to try out without committing to one brand of lights. 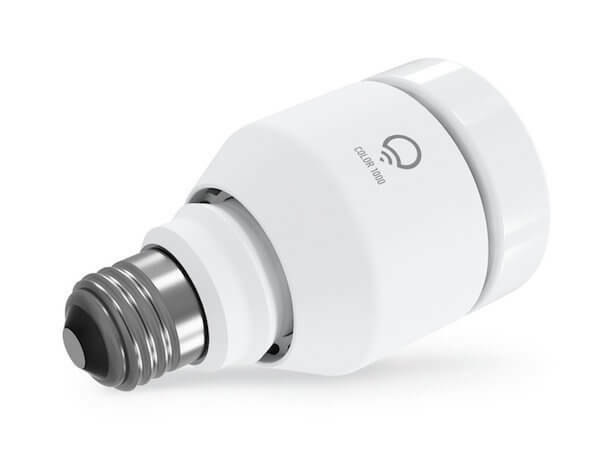 All of the smart lights listed here can connect multiple bulbs together and they also work with iOS/Android. 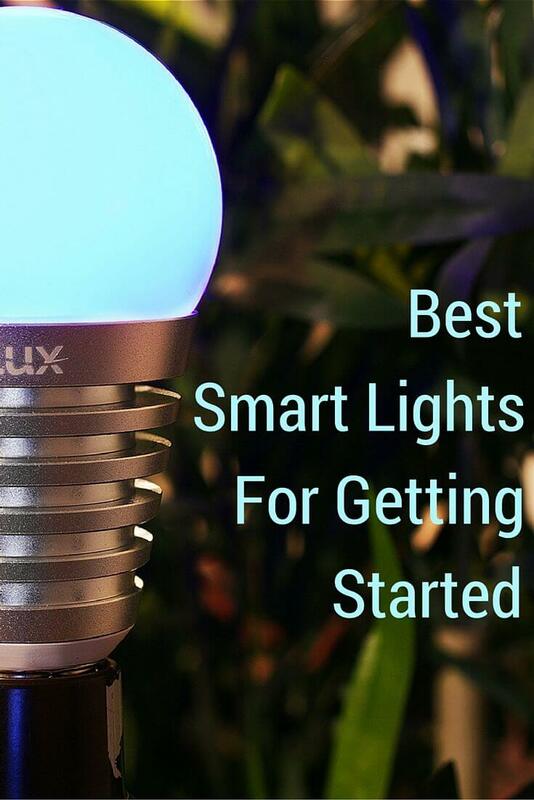 LIFX is one of the best smart lights out there because of its brightness and compatibility with other devices. It connects to your WiFi and is easy to set up with the LIFX mobile app. It is more expensive but for all the things it’s capable of, it is worth it. Check out LIFX’s IFTTT channel to see all the stuff it can do. Our favorite is the alarm which slowly fades the lights on. 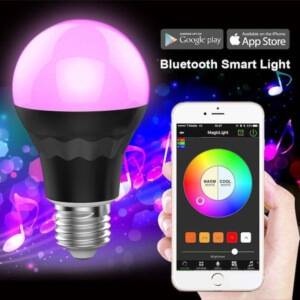 MagicLight is a great option for a color changing smart light. The light can change to match the music playing on your mobile device which is a pretty cool feature. It is controlled via Bluetooth with the MagicLight app. One of the downsides to MagicLight is not being able to control it away from your house. 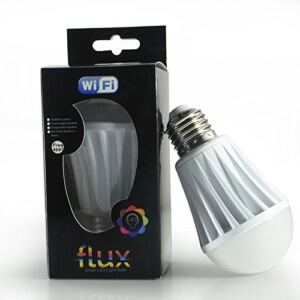 Flux WiFi light is another great option for an inexpensive colored smart light. Flux is similar to the MagicLight in that the light can change with the music but Flux differs in that it can be controlled away from your home. The light is controlled using the Flux WiFi app. The Phillips Hue wireless dimming kit is a great because it is so simple. 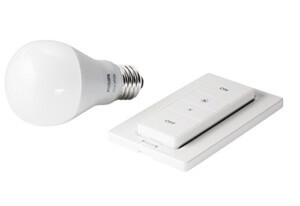 Out of the box the dimmer works with the Hue Single LED bulb which is included. This is the only light in this article that does not change colors, but the dimmer works on colored Hue lights if bought separately. The dimmer also works with the Hue bridge if added on later, allowing you to upgrade to a hub if you ever decide to. Well that is a wrap of the best smart lights without hubs. All of these lights are great options if you are getting started or want to add a new addition to your arsenal. Checkout our WiFi Light Comparison Page for more lights with their prices and ratings.